Team Win Recovery Project 3.x, or twrp3 for short, is a custom recovery built with ease of use and customization in mind. Its a fully touch driven user interface no more volume rocker or power buttons to mash. The GUI is also fully XML driven and completely theme-able. You can change just about every aspect of the look and feel. -Fix a bug with the input box that affected masked inputs (passwords). This fixes decrypt of full device encryption on devices that support decrypt. This bug also impacts encrypted backups. Users are highly encouraged to stop using 3.0.1 if you use encrypted backups or if you need decrypt of data in TWRP. -Add Greek translation to some builds. WARNING: This is our first release in a long time. We have a lot of new and somewhat aggressive changes in this new release. The changes to the graphics back-end may cause some devices to not boot up properly or have other display-related issues. If you are not in a position to reflash an older build of TWRP, then wait until you are or at least wait until others have tried the new version for your specific device. You don’t want to end up with a non-working recovery and have to wait several hours or days to get to a computer to be able to fix it. Notes for themers: In addition to the udpated theme, we have introduced a theme version variable to the TWRP theme system. If the theme version does not match the version that TWRP expects, TWRP will reject the custom theme and load its stock theme. This change will ensure that people who update TWRP without updating their theme will still have a workable recovery. We have removed libjpeg support. The stock theme was only using a jpeg image for the splash / curtain. This change means that any custom themes will no longer be able to use jpeg images. It also means that tools used to repack recovery images with a different curtain / splash will need to be updated to use the new method. Version number notes: For a while we’ve been using a 4 digit version number and reserved the 4th digit for device-specific updates. For instance, we find and fix a device-specific issue like decryption of data on Nexus 5, we would release that as a 2.8.7.1. After a while, some people would start asking where 2.8.7.1 was for other devices. So, going forward we have decided to change the numbering scheme to 3.0.0-2, etc. Our hope is that this version numbering scheme will more clearly identify that the 4th digit does not indicate a version change for the code base. We need your help! The bulk of TWRP work is done by 3 people on a volunteer basis. We have pushed most of our device files to our github and we have a gerrit instance. If you have the ability, please help us maintain our official devices and/or add your device to our official device list. Thanks in advance! Note: As always, be sure your custom theme is up to date (or remove your custom theme) before updating TWRP. System read only option: Devices that ship with 5.0 and higher as their initial OS are using block level OTA updates. With this style of OTA update, the update script checks to see if the system partition has ever been mounted read/write. Further, the script also usually runs an SHA sum of the entire system partition to detect if any changes have been made. If any changes have been made, the OTA update will refuse to install. Since not all OEMs and devices have factory images available, we have created a new feature in TWRP that detects if the system partition has ever been mounted read/write. 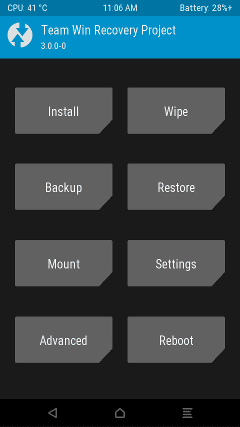 If not, you will be prompted asking if you want TWRP to mount system as read/write. If you choose not to allow TWRP to mount as read/write, TWRP won’t prompt to install SuperSU and TWRP won’t try to patch the stock ROM to prevent TWRP from being replaced by stock recovery. The goal of this option is to hopefully allow the user to make a raw system image backup that they can use to get back to a state where they can take OTA updates again. resize2fs feature: On some devices like the Nexus 6, the factory images include a userdata image that is the proper size only for the 32GB units. If you flash the factory image to a 64GB Nexus 6, the data partition will appear as if it only has the free space of a 32GB device. Using the resize2fs option, TWRP can resize your data partition to take up the full space available. The resize2fs may also be useful to resize system partitions on devices where custom ROM system images don’t take up the full partition space. Lastly, resize2fs may be useful in some cases to reserve the proper space at the end of a data partition for a full disk encryption key, should your partition be formatted incorrectly for some reason. This new version also marks our first set of full builds using our new jenkins build server. You can track the progress of builds at https://jenkins.twrp.me and we have taken additional steps to make it easier for device maintainers to step up and submit patches to our gerrit server at https://gerrit.twrp.me to help us keep devices up to date and working. If you have found a bug, please consider posting it to our github issues log. It’s pretty much impossible for us to keep up with the more than 40 threads that we have for the devices that we “directly” support. If you have a significant problem that cannot be answered in this thread, your best bet is to PM me directly, contact us via our website, or find us in our IRC channel below. If you see someone that’s struggling, feel free to point it out to us. We need your help to help us keep track of all of our devices! Thanks! Live support is available via #twrp on Freenode with your IRC client or just click this link.